Scallywags gather from schools around the region and sing songs from the last 100 years. At the festival this year we’re treated to the team from Newtown School. Scallywags like to Sing Strum and stomp their way thru a set, using all sorts of weird and wonderful instruments. Playing Vaudeville to Jessie J…Johnny Cash to Bruno Mars. 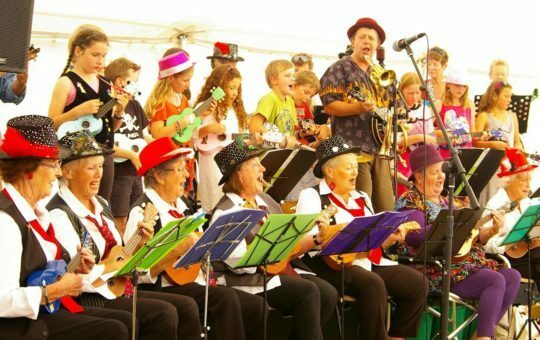 With a background in tap, there is a heavy influence in rhythm says Chief Scallywag Shane, who also runs ‘Uke Clubs’ at a couple of retirement villages. There is something cool about 3 generations playing music together. Grab a Uke and join The Scallywags.